Vandals have forced the closure of a popular bike station in Leith which was used for Edinburgh’s Just Eat cycles scheme. 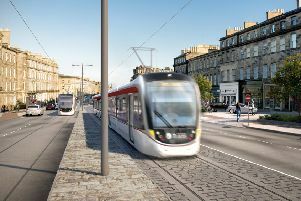 Transport for Edinburgh (TfE) has condemned those responsible for wrecking the station at Leith Links, one of the most popular drop-off and pick up points in the city. And the scheme’s operators are now having to hunt for a replacement site. It comes after a picture emerged on Thursday showing that most of the parking stations - some of which were ripped out of the metal base - had to be covered or taped up because of the damage. TfE chief executive, George Lowder, said: “This is an isolated incident of vandalism and we are working closely with Police Scotland to identify those responsible for this mindless vandalism. “Our priority is to minimise the effect it has on cycle scheme users in the local area. More people than ever are using the bikes to commute to work and study or explore new parts of the city. General manager of Just Eat Cycles, Charles Graham, said: “It’s a real shame that we have had to close Leith Links station due to vandalism, especially as it was one of the best used in the city. “We are committed to finding a nearby replacement site in order to maintain our network in Leith, to ensure the scheme remains practical, enjoyable and safe. An initial 200 branded Just Eat Cycles were introduced from September 17 last year at sites across the city, increasing to 1,000 bikes by the end of 2018 and more to follow in 2019. The bikes are currently manual but operator Serco is working on a new electric assisted bike to make the journey even easier for riders. Starting at just £1.50 for a single journey, users can choose to hire bikes for an hour, day or an annual membership (£90) using a simple smartphone app.